Hi, and welcome to another Inspiration Tuesday at STAMPlorations. For today's card, I've used pieces of Distress-splattered watercolour card. On the blue piece I stamped the large butterfly from Winged Things and cut it out, and on the orange piece I drew a scribbly border with a black fineliner. A quick and easy way of using up scraps of card. 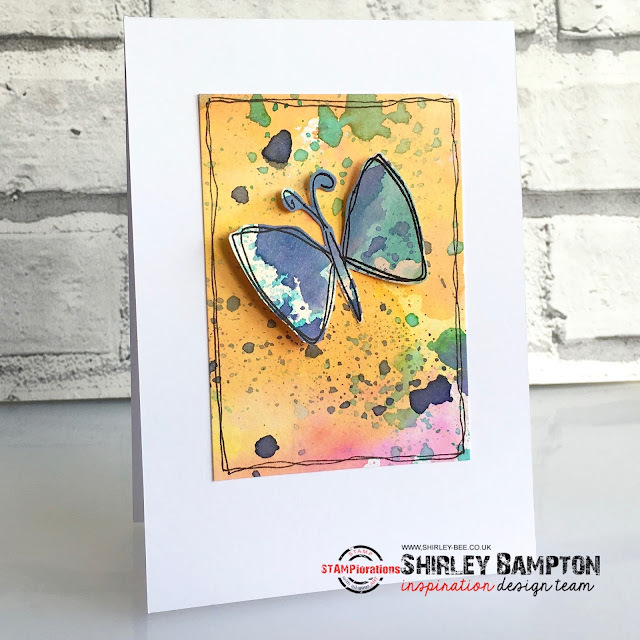 Pop on over to the STAMPlorations blog to see some more fabulous inspiration from the Design Team. Don't forget to leave a comment for your chance to win a $10 gift certificate. 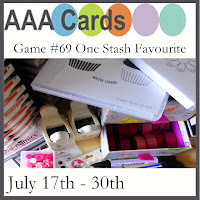 I'm entering this into AAA Cards - One Stash Favourite challenge. My favourite and most-used part of my stash is definitely Distress Inks! Gorgeous card! Fun & creative. I love the spattered background. Awesome card design. Love this card...your butterfly is so sweet. Such a wonderful background, gotta just love those distress inks and all the unique results they produce. Thanks for playing at AAA Cards. LOVE your wonderful distress ink background. Thanks for linking up and playing with us at AAA Cards Game #69. Absolutely gorgeous Shirley. Loving the edge doodling.